I hate to keep flogging a dead horse, but since this issue won’t go away I guess I can’t, either. 1. 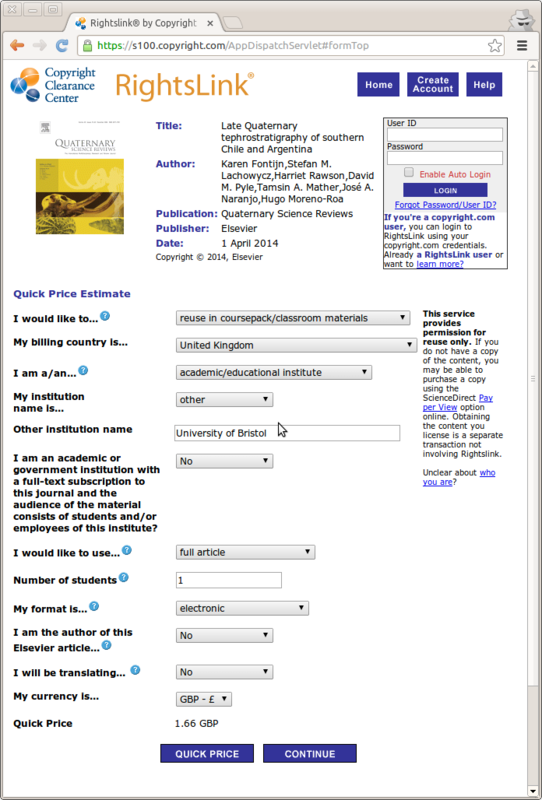 Two years ago, I wrote about how you have to pay to download Elsevier’s “open access” articles. I showed how their open-access articles claimed “all rights reserved”, and how when you use the site’s facilities to ask about giving one electronic copy to a student, the price is £10.88. As I summarised at the time: “Free” means “we take the author’s copyright, all rights are reserved, but you can buy downloads at a 45% discount from what they would otherwise cost.” No-one from Elsevier commented. 2. Eight months ago, Peter Murray-Rust explained that Elsevier charges to read #openaccess articles. He showed how all three of the randomly selected open-access articles he looked at had download fees of $31.50. No-one from Elsevier commented (although see below). As noted in the comment thread to your blog back in August we are improving the clarity of our OA license labelling (eg on ScienceDirect) and metadata feeds (eg to Rightslink). This is work in progress and should be completed by summer. I am working with the internal team to get a more clear understanding of the detailed plan and key milestones, and will tweet about these in due course. Now here is my problem with this. First of all, either this is deliberate fraud on Elsevier’s part — charging for the use of something that is free to use — or it’s a bug. Following Hanlon’s razor, I prefer the latter explanation. But assuming it’s a bug, why has it taken two years to address? And why is it still not fixed? Elsevier, remember, are a company with an annual revenue exceeding £2bn. That’s £2,000,000,000. (Rather pathetically, their site’s link to the most recent annual report is broken, but that’s a different bug for a different day.) Is it unreasonable to expect that two years should be long enough for them to fix a trivial bug? All that’s necessary is to change the “All rights reserved” message and the “Get rights and content” link to say “This is an open-access article, and is free to re-use”. We know that the necessary metadata is there because of the “Open Access” caption at the top of the article. So speaking from my perspective as a professional software developer of more than thirty years’ standing, this seems like a ten-line fix that should take maybe a man-hour; at most a man-day. A man-day of programmer time would cost Elsevier maybe £500 — that is, 0.000025% of the revenue they’ve taken since this bug was reported two years ago. Is it really too much to ask? Now here’s where it turns sinister. The PeerJ bugs I mentioned above cost them — not money, directly, but a certain amount of reputation. By fixing them quickly, they fixed that reputation damage (and indeed gained reputation by responding so quickly). By contrast, the Elsevier bug we’re discussing here doesn’t cost them anything. It makes them money, by misleading people into paying for permissions that they already have. In short, not fixing this bug is making money for Elsevier. It’s hard not to wonder: would it have remained unfixed for two years if it was costing them money? I find that very hard to accept. However complex your publishing platform is, however many different modules interoperate, however much legacy code there is — it’s not that hard to take the conditional that emits “Open Access” in gold at the top of the article, and make the same test in the other relevant places. @TAC_NISO @MikeTaylor If you've been taking people's money under false pretenses for 2 years, "it's a hard fix" is not an excuse. Come on, Elsevier. You’re better than this. Step up. Get this done. Ten days layer, Elsevier have finally responded. To give credit where it’s due, it’s actually pretty good: it notes how many customers made payments they needn’t have made (about 50), how much they paid in total (about $4000) and says that they are actively refunding these payments. It would be have been nice, mind you, had this statement contained an actual apology: the words “sorry”, “regret” and “apologise” are all notably absent. And I remain baffled that the answer to “So when will this all be reliable?” is “by the summer of 2014”. As noted above, the pages in question already have the information that the articles are open access, as noted in the gold “Open Access” text at top right of the pages. Why it’s going to take several more months to use that information elsewhere in the same pages is a mystery to me. As noted by Alicia in a comment below, Elsevier employee Chris Shillum has posted a long comment on Elsevier’s response, explaining in more detail what the technical issues are. Unfortunately there seems to be no way to link directly to the comment, but it’s the fifth one. Tech isn’t in their ‘DNA.’ That is the future of publishing and they’re losing the plot. Of course, that raises the question of what is in their ‘DNA,’ but will leave that to others to answer. In support of the honest incompetence theory, I’m aware of at least one article in a hybrid journal where Elsevier have carefully and efficiently made it open-access without the author ever actually asking/paying for it! Scant consolation for the opposite case, though. I had a similar problem to this with some Wiley journals a while ago (displaying an OA “open padlock” and making it free-to-read, but simultaneously claiming all-rights-reserved and happily charging for copies). I don’t think it was quite the two-day PeerJ level of response, but credit where it’s due, they did get it fixed after we flagged it up – the licenses are now reported on the article page and the rightslink page reports in big red letters that it’s free for NC use. “Come on, Elsevier. You’re better than this.” – I think after 2 years, it’s an ineluctable conclusion that, no, Elsevier is not better than that. I just posted the following comment on Elsevier’s Open access – the systems journey page. I’m reposting it here in case they moderate it into oblivion.